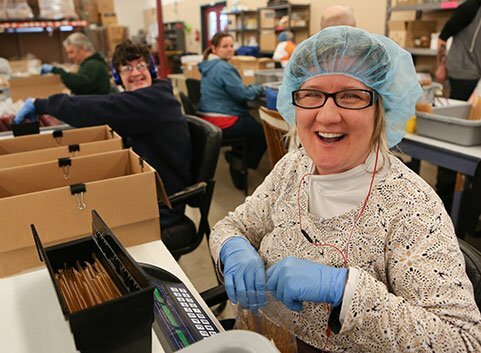 We provide employment and vocational training for adults with developmental disabilities through subcontract work for businesses and organizations in Oregon and across the country. This program allows our more vulnerable citizens in the community to build work skills, self-esteem and independence. Whether you need customized packaging for food, miscellaneous parts or promotional items, we have the organization, equipment and quality control to prepare and deliver orders efficiently on your timeline. We follow stringent food safety and sanitation regulations, including implementation of good manufacturing practices and implementation of Hazard Analysis and Critical Control Points (HACCP) principles. We are organically certified through Organic Certifiers of Ventura, CA. We provide customized sublimation printing and engraving for a variety of products including name plates, name tags, mugs, shirts, awards and signs. Browse our store to place your order! We offer domestic and international bulk mail services through UPS, USPS and FedEx. We can print, fold, collate and deliver mail to fulfill your advertising needs. In our facility’s metal shop, we can cut, grind, shape and fabricate metals into almost any shape. We operate a multi axis Computer Numerical Control (CNC) machine. Contact us to become a Business Partner or to learn more. Your gift helps our clients to grow and live an enriched life. First and foremost, Pearl Buck Center does a great job. Second, it’s just a rewarding relationship. It’s a win-win for everybody. Every time I walk into Pearl Buck Center, I feel proud that I’m a partner. It’s not only rewarding for me personally, but it’s also a good selling point for people to see that my company is giving back. We appreciate our business partners who help us change lives for the better every day.